Most of us as children were probably partial to elaborate cream cakes, well before obesity became a household word. Even at the time there was often the wise parental admonition not to eat too many at once, or face the inevitable consequences quite soon afterwards. In a way this is what we’re offered here on this equally naughty-but-nice CD from Naxos. For most listeners, the name Czerny is synonymous with hundreds of perhaps tedious studies for young and emerging pianists at every level of technique from the ‘School of Velocity’, to the later ‘Art of Finger Dexterity’. The fact that these two volumes – Opp. 299 and 740 respectively – have such high opus numbers, attests to the Austrian composer’s prolific output. 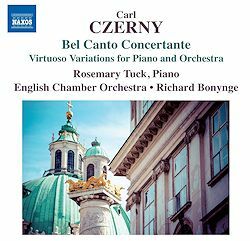 That said, Carl Czerny wrote so much more than just studies, and it is great to have more and more of it become available on CD. Not surprisingly, Czerny was an immensely organised composer who, according to the most informative sleeve-note by Allan Badley, grouped his works into four distinct categories: 1) studies and exercises, 2) easy pieces for students, 3) brilliant pieces for concerts, and 4) serious works. The distinction between the last two categories is important, because it confirms the essential purpose of the kind of work recorded here. The Irish composer, John Field, stayed with Czerny in Vienna in 1835, and described Czerny’s study as a ‘composition factory’, simply because he kept samples of every conceivable type of passage-work filed there in a large cupboard, which was used both for teaching purposes and in his own works. As Badley explains, ‘(Czerny’s) students, or assistants, would be given instructions to transpose selected passages into the appropriate key and incorporate them into the works they were busily copying for their teacher’. This formulaic approach to composition was nothing new, and Czerny’s rigorous application of it sat well with the new industrial age. It is not light years away from modern practices using a music-notation programme to effect some basic transpositions, or copy and paste processes. A composer like Schumann, for whom purity in art was paramount, wrote exceedingly scathingly about Czerny, his music, and methods. The four items on the CD – which bears the title ‘Bel Canto Concertante - Virtuoso Variations for Piano and Orchestra’ – are typical of the time. They draw their inspiration from themes from the most popular operas of the day and are simply designed as ‘brilliant pieces for concerts’, as per 3) above. Badley informs us that the ‘Variations on Swedish National Airs’ by Czerny’s contemporary, Ferdinand Ries, appears to be the first work of its kind in the genre, subsequently cultivated by Hummel and a host of other pianist-composers. Czerny’s works were composed between 1828 – Introduction, Variations and Polacca, Op 160 – and 1833 or so, the Introduction, Variations et Presto finale, Op 281. In each case the work was written within a few years of the opera upon which it is based. Each one is essentially similar in overall design, and follows Ries’s pattern: a slow, often pompous yet lyrical introduction, and the presentation of the theme and its variations, the last of which becomes extended to form a finale. Like those of Ries and Hummel, Czerny’s introductions are freely composed, whereas the quotation of thematic material from the respective opera forms the basis of the main body of the piece. As the works essentially need to be effective in performance, the choice of theme is more down to its popularity and recognisability, than its intrinsic music interest. Czerny often adds a little codetta (add-on ending) to the theme, which is played by the orchestra. The variations start out by following the theme’s contours pretty closely, becoming more freely ordered as the work progresses. Equally, they tend to become more virtuosic with each successive variation, to which Czerny adds a little extra zing by increasing the tempo proportionately. A slow, expressive variation is included – never overlong, but strategically placed for the best overall effect. In a work like Brahms’sVariations and Fugue on a Theme by Handel, the theme is organically developed, taken apart and virtually reformed. By contrast, Czerny’s modus operandi is simple variation. He explores a succession of figurations that are only really loosely connected with the themes, somewhat confirming Field’s notion of a ‘composition factory’ approach. Czerny does, however, become a little more adventurous in the longer variations. This is not to detract in any way from the sheer enjoyment of these works which set out, and certainly very much achieve what it says on the tin. They have an immediate appeal and that was Czerny’s sole intention. He varies the way in which he describes each work on the present CD, but effectively it’s only in the third example that he specifically mentions the inclusion of a closing Polacca (Polonaise). This does achieve an effective change from duple to triple meter, seemingly giving it a new lease of life towards the conclusion. The recording quality is good, and the English Chamber Orchestra provides a secure, but not intrusive accompaniment. Australian pianist, Rosemary Tuck, despatches each work with real panache and élan, making light of the often complex pianistic gyrations and fireworks. She is also well able to treat the more serious parts with appropriate, if not necessarily tongue-in-cheek, solemnity. Richard Bonynge is the ideal choice of conductor here, as he directs proceedings with the same stylistic empathy he had when wielding the baton over the singing of his late wife, Dame Joan Sutherland, in many similar coloratura roles, except here the soloist is now the pianist. At Naxos’s bargain price, it would be virtually impossible not to welcome this charming CD. After all, each work is both attractive and uncomplicated to listen to and gives a good insight into the art of simple variation. The music also elucidates the origins of some of the more-extended pianistic figurations found in later similar display-works by Chopin, Mendelssohn and Saint-Saëns. If you find that listening to all four works in succession, is just a bit too much for one sitting, then return to your parents’ advice above, and perhaps try them one or two at a time – that way there’s no chance of overindulging.